The Illusionists - Witness the Impossible, the non-stop spectacular featuring seven of the most talented illusionists from around the world, comes to Philadelphia on a national tour, February 24 through March 1. 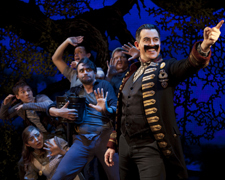 Pictured: Andrew Basso - The Escapologist (photo courtesy of the Kimmel Center). 18 things to do this week in the Philly region. Robin Bloom offers her picks. The Rodin Museum has undergone a full-scale reinstallation and reopens with a new presentation showcasing the artist’s most iconic portraits and works that have not been viewed by the public in several years. Built in 1929 to house the greatest collection of works by the French sculptor outside of Paris (assembled by philanthropist Jules Mastbaum), Auguste Rodin is known for changing the face of figurative sculpture and bringing it into the modern era. Pieces on display span the artist’s career. Examples include subjects such as Honoré de Balzac, Pope Benedict XV, the women in Rodin’s life including Rose Beuret and Camille Claudel and key sculptures in bronze, marble and plaster. 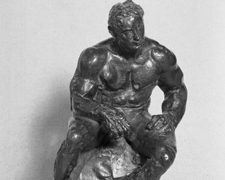 Also, The Athlete, a work that conveys Rodin’s fascination with anatomical detail (pictured). The model for this work was Samuel Stockton White III, the only Philadelphian to model for Rodin. The Rodin Museum (administered by the Philadelphia Museum of Art since 1929) is located at 22nd Street and the Ben Franklin Parkway, Philadelphia. Photo courtesy of the Philadelphia Museum of Art. Rodin: The Human Experience – Selections from the Iris and B. Gerald Cantor Collections opens at the James A. Michener Art Museum February 28 through June 14. The exhibit features 52 career-spanning bronze sculptures by the French artist including famous depictions of writer Victor Hugo, musician Gustav Mahler, major achievements of his career including The Burghers of Calais, works derived from his masterpiece The Gates of Hell, as well as Monumental Torso of the Walking Man (an homage to his admiration for Michelangelo), and a special loan of The Thinker from the North Carolina Museum of Art, 138 South Pine Street, Doylestown, PA. Learn more at a Tuesday lecture series beginning March 3 through April 21. Talk Story: In Love and War, the World of Rodin, a collaboration with the Bucks County Playhouse where participants use theatre techniques to develop and perform stories from their own lives (inspired by Rodin sculptures) can be seen through May 2. 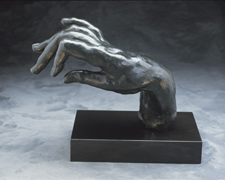 Pictured: Auguste Rodin, Large Hand of Pianist, modeled 1885, Musée Rodin cast 9 in an edition of 12 in 1969, bronze, 7 ¼ x 10 x 4 7/8 in., Collection of Iris & B. Gerald Cantor Foundation. Photo courtesy of the James A. Michener Art Museum. 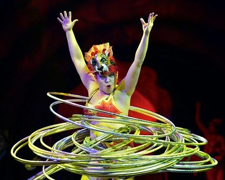 Circus Oz, Australia’s national circus, brings the only east coast appearance of its brand new show But Wait…There’s More to McCarter Theatre Center for three performances, February 21-22. Known for its vaudeville-inspired show, the production is a witty satire of today’s fast-paced lifestyles with breathtaking stunt-jumping acrobatics, juggling, trapeze flying, impersonations, and irreverent humor, all set to live music. The all ages spectacle is animal free on the Matthews Stage, 91 University Place, Princeton, NJ. 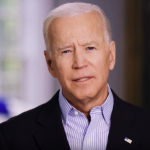 Photo: Joe Armao. “Witness the impossible” with the Illusionists, the non-stop spectacular featuring seven of the most talented illusionists from around the world, appearing in Philadelphia on a national tour, February 24 through March 1. 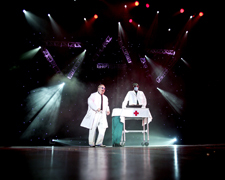 The troupe specializes in shock and technology illusions, weapons and comedy magic, death defying acts, and manipulation, as part of the Kimmel Center’s Broadway series, Academy of Music, Broad Street, Philadelphia. Pictured: Kevin James, the Inventor (photo courtesy of the Kimmel Center). The 4th annual Bierfest returns to the German Society of Pennsylvania (pictured) Saturday, February 21, 2pm-5:30pm, celebrating Pennsylvania’s rich heritage of German beer brewing. The family friendly afternoon offers German-style beer from nearly two dozen craft and legacy brewers from Pennsylvania, German cuisine, live bluegrass music and oompah-funk, the Philly Roller Girls, the new Bierfest Beer and Cheese Cave, cabaret-themed Berlin-Style BEERlesque, and more. Participating brewers include Lion Brewery, Yards Brewing Company, Straub Brewery, Yuengling & Sons Brewery, and more, at the Spring Garden and 7th Street Buildings, Philadelphia. Photo courtesy of the German Society of Pennsylvania. The Fringe Wilmington Film Festival is underway through February 22. Now presented as 3 separate festivals throughout the year (visual fringe in the spring and live fringe in the fall), Delaware’s only multi-day celebration of unconventional art showcases independent films by local, regional, and national filmmakers with a wide variety of genres. 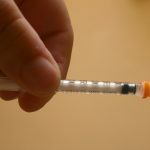 Films include The Seagull, Young, Wild and Out of Control, Black Girl in Paris, Travel Songs: Peru (pictured), Keep it Kool – the Kool Keith Story, and more. Special events include an evening dedicated to music documentaries on Friday, February 20 and an afternoon with renowned filmmaker John Evans, Sunday, February 22, Theatre N at Nemours, 1007 North Orange Street, downtown Wilmington, DE. Photo courtesy of Fringe Wilmington Festival. 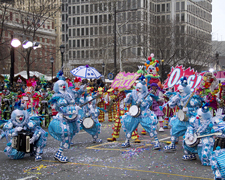 Celebrate Mardi Gras in Manayunk with the Mummers! 17 string bands including the Fralinger String Band (pictured), Quaker City String Band, Woodland String Band, South Philadelphia String Band and many more will parade down Main Street from Green Lane to Lock Street, Sunday, February 22 beginning at 10am. The family friendly event offers face painting, pictures with the string bands, silent auctions, raffles, and more. Free to attend with $10 bracelets for access to activities. Rain date February 28. 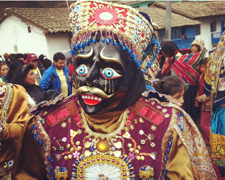 Photo courtesy of the Fralinger String Band. Celebrate the funky sounds of Sly and the Family Stone with Prophets of Funk, February 20, 8pm at Swarthmore College. 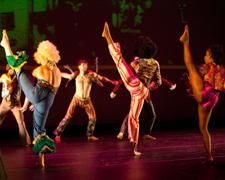 The performance, by David Dorfman Dance (DDD), pays tribute to one of the first racially and gender-integrated bands in America and their groundbreaking vision, in the Lang Performing Arts Center, Swarthmore PA. Prophets of Funk is the central performance of a three week residency at Swarthmore College called Radical Democracy and Humanism: Intersections Between Performance and Action, critical discussions, workshops, classes, and lectures that address positions and assumptions regarding issues of race, class, gender, sexuality, religion, politics and the environment. A master class in dance technique will be held on Thursday, February 19, 4:30pm. Photo by Adam Campos. 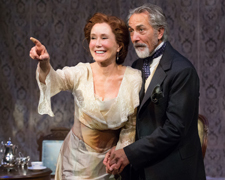 Catch stage and screen stars Mary McDonnell and David Strathairn in The Cherry Orchard, onstage at People’s Light through March 8. The popular play by Anton Chekhov was the Russian playwright’s last, written in 1904, reflecting the socio-economic forces at work in Russia at the turn of the 20th century as a woman and her brother return to their ancestral estate as it is about to be auctioned. Adapted by Emily Mann, Artistic Director at McCarter Theatre in Princeton, and directed by Abigail Adams, the play marks Mary McDonnell’s return to the stage after 18 years. 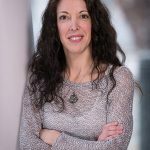 The former King of Prussia resident performs alongside her daughter Olivia Mell and with David Strathairn, who last performed at People’s Light in 2009. Company members include Peter De Laurier, Andrew Kane, Mark Lazar, Stephen Novelli, Pete Pryor, and Mary Elizabeth Scallen. Enjoy Scoop on Wednesdays: History, Context, and Gossip, February 25 and March 4 and talkbacks on February 19, 26, and March 5, 39 Conestoga Road, Malvern, PA. Photo by Mark Garvin. 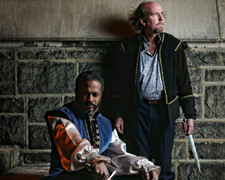 Shakespeare’s epic tragedy Othello is onstage at Curio Theatre Company. The raw, stripped down version brings to life the Bard’s classic tale of jealousy, passion, ambition, and betrayal with Steven Wright as the Moor of Venice, Brian McCann as Iago, and Isa St. Clair as Desdemona. Also featuring Paul Kuhn (who designed the set), Eric Scotolati, Steve Carpenter, Bob Weick, Rachel Gluck, and Colleen Hughes. Dan Hodge, co-founding artistic director of the Philadelphia Artists’ Collective, directs, through March 14 on Curio’s intimate Corner Stage, 4740 Baltimore Avenue, Philadelphia. Entrance is on the corner of Baltimore and 48th Street, down the stairs. Opening night is Friday, February 20. Photo by Kyle Cassidy. 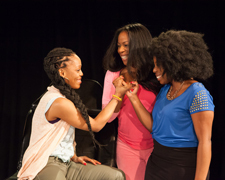 Simpatico Theatre Project continues its season dedicated to highlighting significant works by women with Kirsten Greenidge’s Milk Like Sugar. The Obie Award winning play spotlights the struggles and overlooked aspirations of inner-city families and the social causes that pull them apart, as 16 year old Annie tries to find a way to move past the socio-economic limitations holding her back. Blending hip-hop-inspired poetry with dramatic comedy, Allen Radway (Simpatico’s Producing Artistic Director) directs the cast including Kimberly S. Fairbanks, Nastassja Baset, Melanie Lawrence, Danielle Leneé, Curtisha Starks, Walter DeShields, and Brandon Pierce, through March 8 at the Skybox at the Adrienne, 2030 Sansom Street, Philadelphia. Special events include $5 student rush Wednesdays, Industry Night and Simpatico Social on March 2, panel discussion with I Matter Philly to find out more about local resources for Philadelphia teens on February 22. Photo by Kathryn Raines and Plate3. Find out how Peter Pan became the boy who never grew up with Peter and the Starcatcher, onstage at the Playhouse on Rodney Square (formerly the DuPont Theatre), through February 22. The funny, innovative and imaginative five time Tony Award winning musical is a prequel to Peter Pan, based on the best-selling novel by Dave Barry and Ridley Pearson and featuring a dozen actors playing more than a hundred characters, DuPont Building, 1007 North Market Street, Wilmington, DE. Photo by Scott Suchman. Welcome the Year of the Goat/Sheep! 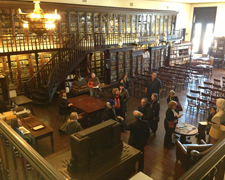 Celebrate at the Please Touch Museum February 19-21 with live music, ribbon dancing, Chinese calligraphy, Billy the Goat puppet, stories and more, Memorial Hall, 4231 Avenue of the Republic, Fairmount Park, Philadelphia. International House Philadelphia’s 15th Annual Lunar New Year Celebration takes place Friday, February 20, 6pm. Enjoy traditional musical and dance performances and a sampling of traditional Chinese cuisine, 3701 Chestnut Street, Philadelphia. 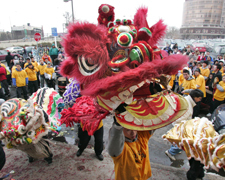 Independence Seaport Museum’s annual Lunar New Year celebration is Saturday, February 21, 11am-3pm, with cultural activities from China, Japan, Korea, and Vietnam, including crafts, dancing, storytelling, calligraphy, martial arts workshops, dance performances, food, and more, Penn’s Landing, Philadelphia. The Philadelphia Museum of Art hosts a family celebration Sunday, February 22, 10am-3pm, with art-making, performances, and tours of the exhibit Ink and Gold: Art of the Kano and more, Benjamin Franklin Parkway, Philadelphia.